The D-240E Flamed Mahogany features the same full-bodied and powerful tone of the D-240E, but with exotic flamed mahogany back and sides and a solid spruce top for a meaty tone and dynamic response. 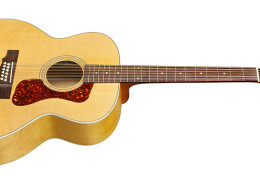 The dreadnought shape provides guitarists with a classic acoustic sound and balanced voicing, and Guild’s historic archback design offers improved bass response and projection. The D-240E also features Guild’s AP-1 preamp system for easy control while amplifying your signal for use in stage or studio. Other features include a Pau Ferro fingerboard and bridge, bone nut and saddle, pearloid rosette, tortoiseshell pickguard, and an amber-tinted satin polyurethane finish. Comes with a Deluxe Guild gig bag.